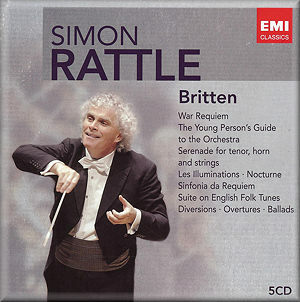 EMI’s latest release in its Simon Rattle Edition showcases his Britten recordings. It is on the whole fantastic and, along with his Mahler set, deserves to take its place among Rattle’s finest achievements. Many of these recordings have already achieved an awesome reputation in their own right, and the crowning glory here is the War Requiem. This is an astonishing interpretation of one of the great works of the 20th century. The performance itself is wonderful, but it is the demonstration quality of the sound that really sets it apart from its competitors. It’s well known that Britten planned the work with three components: the main orchestra and choir to sing the Latin liturgy, a distant boys’ choir to sing some passages, and a close-up chamber orchestra to accompany the Owen poems with the tenor and baritone soloist. Every recording worth its salt has tried to capture these contrasting acoustics, but for me it is Rattle’s that does so most successfully. Engineers John Willan and Michael Sheady surpass even the achievements of John Culshaw on Britten’s own recording, so striking is the difference in the spacing and balance. The acoustic is ideally suited to each component, making the work come alive in a more well rounded and enveloping way than any I have heard before. As for the performance Hickox’s version may have more convincing soloists, but it is Rattle’s command of the arc of the score that convinced me more. That is in no way to denigrate the achievements of Elisabeth Söderstrom, Robert Tear and Thomas Allen, all of whom are well contrasted and, in their own way, excellent. It is just that the cast iron grip of the orchestration and structure impressed me most, and the choral work is beyond praise. Simon Halsey really transformed the CBSO Chorus in the 1980s and their clarity of diction sits alongside their musical assuredness in great tribute to Halsey’s achievements. Just listen to the fugal sections of the Offertorio to see what I mean. Every section of the orchestra shines in the enveloping acoustic, such as the hair-raising brass at the beginning of the Dies Irae, and the shattering climax of the Libera Me, leading the way for the stunned deadness of the final Strange Meeting. This great recording at budget price is reason enough to consider this set. The other, related work, is Ballad of Heroes which also appears on Hickox’s War Requiem. It is secure and exciting here, with excellent diction making nearly all the words easily understood. Robert Tear’s noble tenor solo increases the poignancy of this pacifist hymn. The Building of the House and Praise We Great Men are less substantial choral works but just as satisfying in their own way. The other reason to grab this set at the earliest opportunity is Ian Bostridge’s recording of the three great orchestral cycles with the BPO. Each of these is a revelation, and with Rattle and Bostridge you feel like you are eavesdropping on one of the truly great musical collaborations of our time. Bostridge captures the unique mood of each song but is a master of characterisation so that these readings are never routine. He sounds heroic at the start of Les Illuminations, matching the big sound from the Berlin Phil, but becomes more sensuous for Phrase, if not quite seductive enough in Antique. He also achieves an unsettling, malevolent snarl in Parade. The other cycles are more intimate. The Serenade for tenor, horn and strings feels much more like a conversation piece, with a beautifully nuanced prologue played by Radek Baborák. Again, Bostridge conjures up a different atmosphere for each song, terrifying in the Dirge and Elegy but positively bucolic for the Hymn. The Keats setting is spectral and enchanting. Each instrumental obbligato is taken with immense character in the Nocturne and the singing is as excellent here as elsewhere. The Wordsworth setting, for example, has a sense of growing horror, leading up to a terrible roar at the final “Sleep no more!”, while the next song is an incredible contrast. This disc got rave reviews when it was first released, and it is wonderful to have it included in this bargain box. The other major recording here is the Sinfonia da Requiem, played with remarkable assurance, its dark, brooding tone glowering convincingly. Not all of the other works in the set are as worthy – I didn’t care much for the American Overture or Russian Funeral – but some works deserve to be much better known. The Diversions are really engaging and Young Apollo is energetic music, strikingly played: it is hard to see why Britten suppressed it. The Suite on English Folk Songs is a world away from Vaughan Williams: it is dark and sarcastic where RVW is bright and cheerful, but the final song, Lord Melbourne, oozes melancholy in its cor anglais solo. The Canadian Carnival overture and Scottish Ballad are much more folksy, without ever being whimsical. Jill Gomez is most seductive in the Quatre Chansons françaises, sounding almost like a young Janet Baker. The Young Person’s Guide is quite fantastic, showcasing the CBSO at its peak in, again, demonstration quality sound. You can hear exactly where each instrument is placed and it makes the whole thing tremendously enjoyable: listen to the theme being bounced around by the strings to see what I mean. All told, then, this set is an outstanding bargain, a chance to collect some of the greatest Britten recordings around at a bargain price, though don’t expect sung texts or translations. The performances are outstanding, the singing is never less than excellent and Rattle conducts with assurance and skill that shed new light on these great works. Not to be missed.